For more than 26 years as a holistic health care practitioner, Kaaren Jordan has enjoyed teaching people to create optimal wellness through understanding how to balance their lives with personalized natural foods, nutrition plans and Jin Shin Jyutsu acupressure. As a life-long animal lover wanting to enhance the health and well being of her animal family, she also adapted the system of acupressure she uses for humans to work with her furry, feathered and scaly friends. 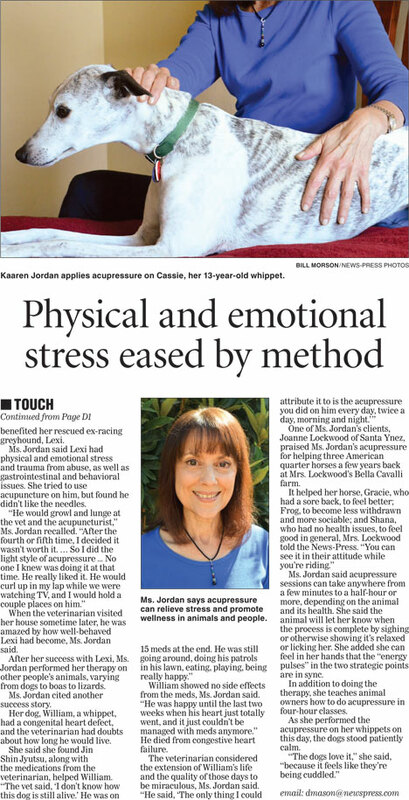 “My holistic health care practice eventually expanded into sharing the same simple, wellness enhancing acupressure routines I use for my animals with clients to improve the quality of their animal companions’ lives through low cost workshops and private ‘at home’ sessions,” said Jordan. The centuries old traditional Asian wellness art of Jin Shin Jyutsu acupressure that she uses in her practice works with the subtle energy flows present in the bodies of all living creatures in a similar way to acupuncture, she notes, to restore and maintain physical harmony and mental and emotional well being. By gently holding specific locations in combined sequences along these energy pathways, the practicioner can facilitate the release of stress and tension as well as unlock the body’s innate ability to heal itself naturally and create optimal wellness. “The ‘At Home Acupressure for Animals’ sessions are quite different from animal massage where a therapist comes to the home to perform massage on an animal,” said Jordan. 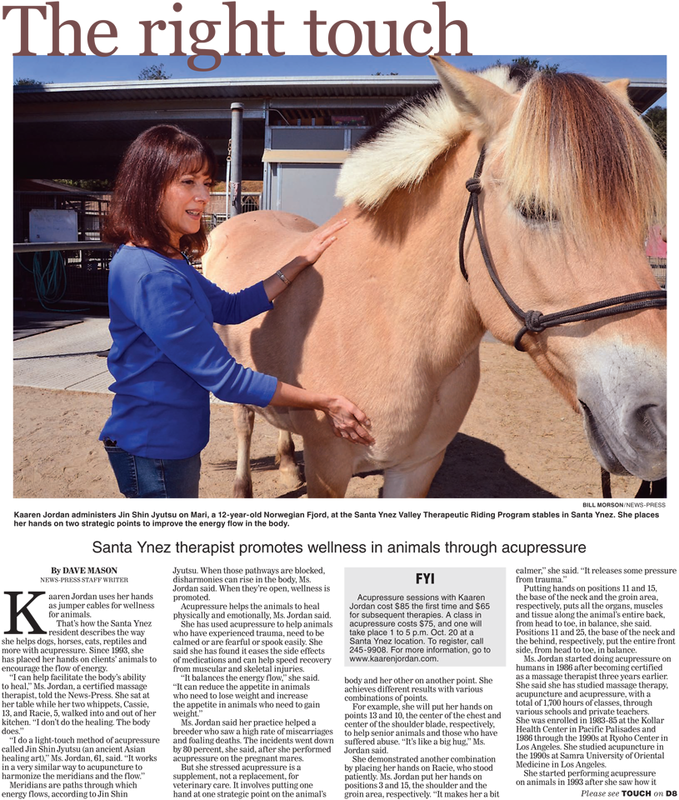 “When I come to a client’s home or barn for a consultation, I not only do a Jin Shin Jyutsu light touch acupressure session (no needles involved) with the requested animal or animals, but also teach the owner or caretaker/groom a simple routine geared towards their animal friends’ needs that can be done in just a few minutes a day. “By learning to apply Jin Shin Jyutsu acupressure at home on your animal companions, you literally stay in touch with their needs and deepen your bond with them. In just minutes a day, you can help your animal friends to increase their confidence levels, relieve anxiety, regulate weight, promote relaxation, and facilitate abuse recovery,” she added. Jordan says that no prior experience in the healing arts is needed to learn the routines — just a love of animals and a desire to help four-legged friends live a healthy, balanced life. The creation of “At Home Acupressure for Animals” began in 1993, when she adopted a retired racing greyhound from Linda and Larry Brown’s rescue center in Acton, Ca. From the start, her new companion, Lexi (aka “St. Lex”) needed a lot of help both physically and emotionally to heal from his experiences on the race track and to adjust to his new life with his new owner in an urban condo. So that Lexi could have the best of both worlds on his healing journey, Jordan employed the help of a veterinarian who also did acupuncture. “Because Lexi did not like the needles involved in acupuncture sessions, I adapted the style of acupressure I used with humans to work with animals. Within a short period of time, our daily light touch acupressure sessions not only helped Lexi to heal physically and to release the emotional trauma, but also served as a deeply fulfilling bonding ritual we both looked forward to,” said Jordan. For more information, call 245-9908.